We delivered our load on Friday in New Jersey and didn't find another load which meant we'd be sitting for the weekend. Ed doesn't like to spend the entire day sitting in the truck so he looked for something to do in the area. We weren't close to public transportation and we don't have our bikes with us so we decided to use Uber. 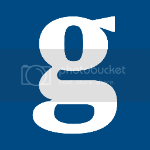 We've used the service a few times now and it's actually pretty great. Affordable, door-to-door service. So yesterday Ed bought tickets for us to see Mannheim Steamroller at the Mayo Performing Arts Center in Morristown, New Jersey. 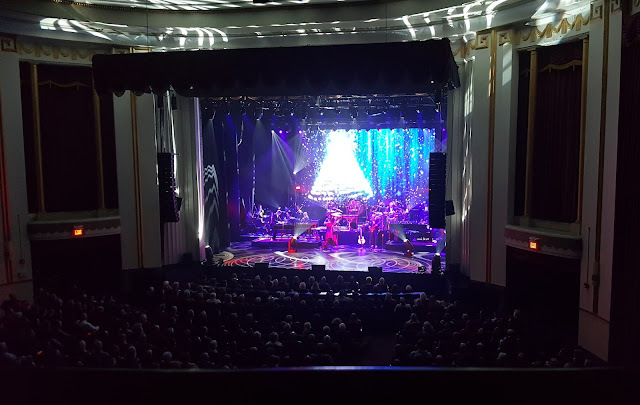 Mannheim Steamroller is a neo-classical new age group known for its Christmas music. In fact, Chip Davis, the founder and leader of the group, is the number one Christmas music artist in history with over 28 million record sold. The second highest selling Christmas music artist is...Elvis Presley. I can't say I loved it. It's a much talked about group, people love them, they're played all over the place during the holidays, and I remember when I worked in the music department of Barnes & Noble almost 20 years ago, how their CDs would fly off the shelves during the holiday. The new-age composition is just not my cup of tea. Too much electronic sound, too much recorder, too much pied-piper sound. Not to mention the weird video accompaniment they had with the show. It looks like they're still using stuff filmed in the late seventies early eighties. I'm glad we got to see the show, but now I'm sure I won't ever be buying the CD. After the show we walked to The Green, a historical park in the center of Morristown, which has been called "the military capital of the American Revolution". It was cold and crisp, in the high forties, which is perfect weather for me. I was in heaven. And what a cute little town! 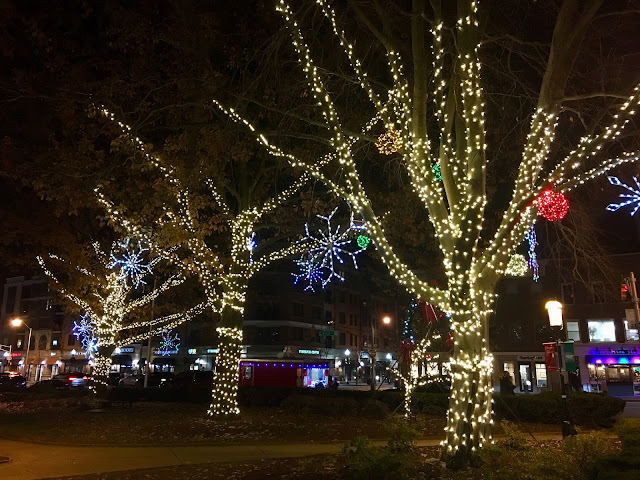 The streets were lined with restaurants and shops, The Green was decorated with Christmas lights, and the area was filled with people walking around and kids waiting with their parents to take a picture with Santa. After spending about an hour walking around, Ed's stomach was telling him it was time to find food. We looked at a few places, which were all busy since it was Saturday night, and finally decided on Nunzio's Dolce Vita, which wound up being right next door to the performing arts center. The place was busy but they were able to squeeze us in. The food was good and we left satisfied. 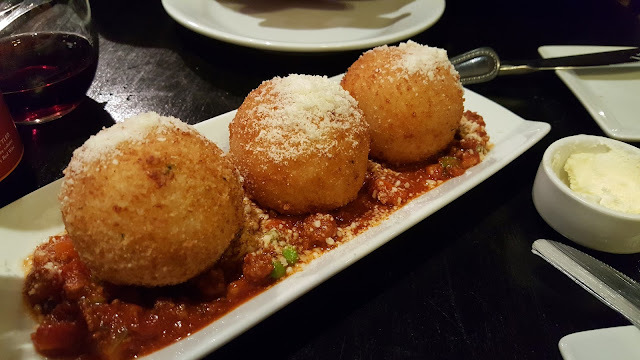 Arancini - our appetizer at Nunzio's Dolce Vita. We hailed an Uber back to the truck and had tea and dessert there while watching a new Redbox movie. It was a great night and as always, I'm glad Ed pushed for us to do something instead of sit around all night. Who knows what he has up his sleeve next?